NEW YORK, Mar 8, 2012 (IPS) – A United Nations envoy has called on the Iranian government to release all political prisoners and prisoners of conscience, and to conduct an extensive, impartial and independent investigation into the violence that followed the 2009 presidential election. 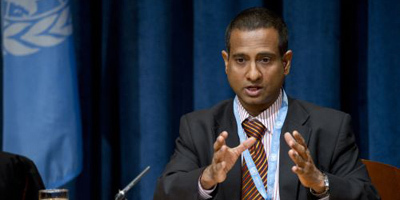 In a 36- page report released at the Human Rights Council in Geneva Wednesday, Ahmed Shaheed, the U.N. special rapporteur on the situation of human rights in Iran, catalogues allegations that amount to a “striking pattern of violations of fundamental human rights guaranteed under international law”. “Mr. Shaheed’s report has utmost importance to the people of Iran, as it proves how oppressed Iranian people are and that their human rights are violated,” Iranian human rights activist and 2003 Nobel Peace Laureate Shirin Ebadi told IPS. “It is also important from an international point of view, because an impartial international authority has reviewed the people’s claims and has presented a report.”Iranian authorities had refused Shaheed’s request for a country visit in September 2011. In October, he presented 58 cases of human rights violations in his interim report to the U.N. General Assembly, prompting a harsh response from Iranian officials who questioned the U.N envoy’s credentials and the credibility of the sources used in the report. In January, Shaheed’s report was sent to Iran for review by government officials. But instead of addressing the issues raised in the report, they again accused Shaheed of bias and inaccuracies. “The Special Rapporteur was engaged in propaganda by participating in forums and gatherings that were contaminated by Western espionage agencies, Zionist elements and terrorist groups,” according to Iran’s official response as stated in the report. It also stated that sources of information, such as reports or complaints, lacked credibility, and that no positive reference had been made to meetings with officials and representatives of civil society. Shaeed countered that he fulfilled his mandate to the best of his ability on the basis of voluminous information collected from a variety of independent and reliable sources. “This rapportueur and the report are all lies,” charged the head of Iran’s judiciary, Sadeq Larijani, during a conference on human rights in Tehran in February. Mohammad-Javad Larijani, the head of Iran’s High Council for Human Rights, also accused Shaheed of promoting Western interests, particularly those of Washington, which has been steadily ramping up the pressure on Tehran over its nuclear programme. “Just by listening five minutes to him, we understand Mr. Shaheed’s and the U.S. secretary of state’s remarks are the same,” Larijani said. In order to fulfill his mandate, the U.N. envoy talked to more than 100 victims and witnesses inside and outside of the country. One student interviewed for the report told IPS that he was contacted by Skype and was able to explain what happened to him during two months in detention. Morteza Kazemian, a prominent political activist and journalist who spent nine weeks in solitary confinement after the 2009 presidential election, told IPS that, “This report can create diplomatic and legal pressure on violators of human rights in Iran, limitations and pressure that can be effective and not harm the people of Iran, as a war would. Thirteen members of Moini’s family, including one of his brothers, have been executed since 1980. Shaheed’s report notes a dramatic increase in the number of executions in Iran, from less than 100 cases in 2003 to at least 670 cases in 2011. “This report is successful as a diary of the suppression of the past two years and the rapporteur has, fortunately, been able to meet with many victims outside Iran, and has recorded their stories,” Moini added. “However, it does not establish a relationship between the suppressive mechanisms and (Iran’s) current laws. This is why most of the demands of the victims of official suppression are absent. The biggest group of victims in this area are journalists and bloggers, and that is not a small number. “The other point is that though impunity from punishment is quite clear throughout the report both in practice and in the victims’ tales, there is no emphasis about finding a clear solution for this problem in the recommendations section,” he said. Ebadi also lamented that the special rapporteur was barred from conducting an on-the-ground investigation in Iran, but said she believed the report was thorough and presented an accurate picture. “The fact that the Iranian government did not allow Mr. Shaheed in the country and did not issue him a visa, though inappropriate in nature, did not have an impact on the accuracy of Mr. Shaheed’s report, as he is well-informed about Iranian affairs through contacts by witnesses from inside and outside Iran who have shared their own observations with him,” she said. “An extension of Mr. Shaheed’s mission has utmost importance for the people of Iran,” she added. Human Rights Council members will decide on whether or not to renew Shaheed’s mandate for another year on Mar. 22.